Have you heard the old joke? When a person speaks two languages we call them bilingual, when they only speak one language what do you call them? American. Now that joke may not apply to you but odds are that you don’t speak as many languages as your Macintosh. And if you don’t happen to speak Azerbaijani, Breton, Croatian, Esperanto and/or Tongan then those languages are taking up space on your hard drive. Even if you remember Spanish, French, or German from high school you may not ever plan to look at an application with the user interface set to that language. If you could delete those language files then you would save disk space. How much disk space you will save will depend on how many applications you have installed and how many of those applications come with a multilingual interface. On my computer I saved 2Gb of storage space. A friend saved 4Gb by deleting those files. One tool that makes it easy to delete the unneeded bulk of both language files (as well as binaries compiled for a processor chip that you computer does not have) is the free application Monolingual. Select what you want to keep and what you want to delete and then press a button and what. Of course, before you do something like this a backup is always recommended. Editors note: I will second Chris’ recommendation for having a good full backup prior to running Monolingual. 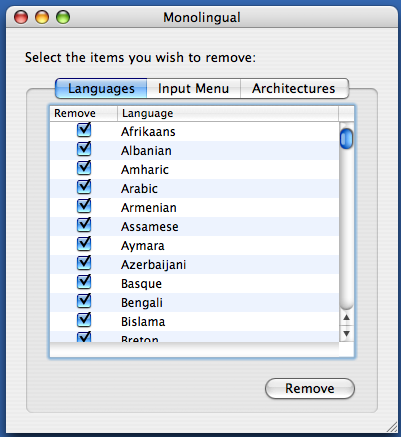 You may remember a time when I recommended Monolingual on the Maccast prior to them adding Universal support. Needless to say some Intel Mac owners were not too happy. The application is Universal now, but still caution is always smart when modifying your system at this low a level. I personally avoid the need to use a tool like Monolingual by doing a custom install and only loading the desired dialect when I re-install OS X (which I will do when Leopard is released). A podcast about all things Macintosh. For Mac geeks, by Mac geeks. Show 181. MacBooks still plagued by cracks. Rumor of Leopard delays. 10.4.9 not recommend if you use FinalCut 4.5. Elton John expands iTunes offerings. Rumors say iMac may be due for a facelift. Follow-up and warning on Save PDF to Web Receipts. Patch available for Stuffit Finder bug. Apple TV first impressions, tips, and thoughts. Handy iPhoto maintenance tip Review: Pioneer DEH-P5900IB. Reverting your installed version of OS X. What to do with old Apple hardware? Doing more with words in OS X. Changing your spell check language. Warning of Apple Store Order phishing email in the wild. Sound issues after 10.4.9 upgrade a feature not a bug. This is Episode 032 of the Maccast Loop. “The Loop”, offers a whole new way to join the Maccast community. It is recorded live each Sunday at 10:00 AM PST/1:00 PM EST. Using the Talkshoe network we offer live audience participation using text and audio chat. You can subscribe in iTunes or by using the links above and then join us live next week. 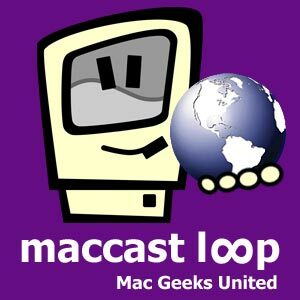 The Maccast Loop is your opportunity to become a part of the Maccast. Each week the hottest topics and issues from the Maccast will be discussed and you will have the opportunity to give your feedback LIVE. Join host Adam Christianson and producer Victor Cajiao (Typical Mac User Podcast) as you become part of the show. Share your thoughts, opinions, tips, tricks, and knowledge of all things Macintosh. The Maccast Loop completes the circuit, closes the loop, and brings the Maccast community even closer. Thanks to my audio engineer and producer, Victor Cajiao (Typical Mac User Podcast [iTunes]) and to all the listeners and participants who make this show possible. Does AppleTV do Standard Def, now it’s maybe? Ok. More information on the possibility of connecting the Apple TV to a standard definition TV keeps coming in. Now “maybe” seems to be the right answer and likely why Apple simply decided to officially say no. This report from Rogue Amoeba’s blog claims that Apple TV will work with SD sets that offer component inputs. I have also seen reports elsewhere of people successfully connecting them to non-HDTVs. Generally, users are discovering that the Apple TV will work with a limited number of standard definition TVs though often with limited success. I have seen reports of some TVs working without issue, but those are rare. More commonly, I am reading about images that are squished or distorted. To get an Apple TV to work with a SD set at all, you do need to put the unit into the 480i mode and connect it using component video cables. For me (I own a 32″ Sony WEGA), the most promising report came from listener Ed who connected an Apple TV to his 27″ Sony WEGA (model #KV-27FS100). Ed reports the picture looks great (see picture). I asked him if his WEGA had the 16:9 enhanced mode offered by my unit and if he needed to enable it to avoid distortion. He said no. This is good news. If I can achieve a picture like Ed’s then maybe an Apple TV is in my living room’s future after all. I will keep you up-to-date as more information comes in. OK. So anyone who has been listening to the Maccast in the last few months knows I cancelled my order for Apple TV and began a rant about how the unit apparently was designed to only work with ED or HDTV sets capable of displaying 480p or better resolutions. Now, to the best of my knowledge my information was accurate and based on the technical requirements for Apple TV from Apple’s own Apple TV web site. The tech specs state the Apple TV has compatibility for, “Enhanced-definition or high-definition widescreen TVs capable of 1080i 60/50Hz, 720p 60/50Hz, 576p 50Hz (PAL format), or 480p 60Hz”. No where in that spec do I see 480i, do you? So imagine my shock (and horror), when I saw the image (pictured right) of an Apple TV set-up screen pass by as I was watching this video over on Gizmodo. It’s a screen for selecting your TV resolution and it lists 480i!!! So have I been wrong this whole time? I even called an Apple on-line store representative prior to cancelling my order and specifically asked if the Apple TV would work with my standard definition Sony WEGA 32″ TV. I was told absolutely, NO. They even reiterated the spec from the web site saying I needed an set capable of EDTV resolutions or better. So, does the Apple TV work with standard definition sets with component video connections? I am now dying to know. Can someone who purchased one solve this debate for us once and for all? If it does, I will be angry and happy all at once as I rush to my local Apple store to get me one. If it does turn out to support a standard definition TV, then my deepest, deepest apologies to those of you who, like me, were led astray by misinformation from Apple. Update: Well, thanks to Dan in the comments for finding at least one answer. Looks like the Teen Geek guys are reporting over on iLounge that the 480i mode is in there to support some older wide screen non-HD sets, but even that doesn’t always work. Poking through the unitâ€™s settings, it turns out that Apple TV was in 480i output mode – we didnâ€™t even know it had such a mode until that point – and the iâ€™Art TV was using that mode. So we switched to 480p, and the iâ€™Art TV wouldnâ€™t work. So was Apple TV to blame? Only partially: the JVC set is an example of a widescreen, non HD set that doesnâ€™t work with Apple TV. And the same 480i mode resulted in a color, but not properly formatted picture on another television we tested. 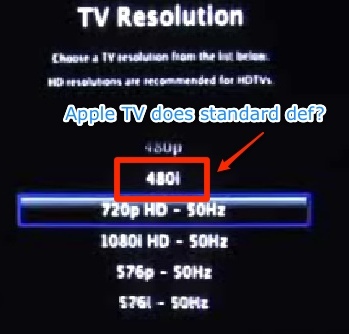 So when Apple says in its tech specs that Apple TV supports 480p or better resolution, ignore the fact that thereâ€™s a 480i setting, and donâ€™t expect it to work on a non-HD widescreen TV. Oh well. As also mentioned in the comments and covered in my AppleTV special the Mac Mini makes a much better Apple home media center solution anyway. Bumrush the Charts: Buy this track today! I had been meaning to promote this earlier, but you know how it goes. If you get a chance and have an extra USD$0.99 to spend today, please go here and click the iTunes link to buy a copy of the track “Mine Again” by the band Black Lab. Why? Well, Christopher Penn from the Financial Aid podcast had this idea to show the power of podcasting and independent music promotion. He plans to take an indie podsafe music track to number one on the iTunes charts, at least for one day. He picked the track “Mine Again” by the band Black Lab because the band was dropped from not just one, but two major record labels (Geffen and Sony/Epic). To make matters worse, the band was forced to fight the labels just to get their own music back. So, if we as individuals can make them number one, even for just one day, it will remind the RIAA and the record labels of what they turned their backs on. We can prove to the labels that bands no longer need them to gain commercial success and artists have options beyond signing draconian record deals. The other great thing about this promotion is that Chris set up an iTunes affiliate link and every commission made on the sale of “Mine Again” will be donated to college scholarships. Not only that, but Black Lab has taken it up another notch and 50% of their earnings are going to be donated to the scholarship fund as well. So join me, other podcasters, and listeners today as we fight back for indie music artists and take back charts. Maccast Server Issues. Things should be OK now. Many of you alerted me to the fact that Maccast.com was down this morning. Thank you all for your email. Looks like we started having issues at around 5:30 AM (PDT) today. I am still working with the hosting company to find root cause of the issue, but generally it looks like some process went haywire and was using up more than it’s fair share of the server resources. This caused a chain reaction resulting in the database no longer being accessible which is the state most of you encountered it in. The good news is, everything seems to be fine now and that bad process has been spanked and sent to it’s room. A podcast about all things Macintosh. For Mac geeks, by Mac geeks. Show 180. Apple releases Airport Extreme update. Apple releases 10.4.9 update. Apple releases iTunes 7.1.1 update. Apple issues iPhoto 6.0.6 update. Updating tip, don’t mess with optimization. Are you the next Trent Reznor?. Apple options recipients may opt for tax relief. Apple TVs might be shipping. Cringley says H.264 for all! Apple is America’s top retailer. iTunes has fixed “blue dot” syncing issues. Tip for browsing photos outside of iPhoto. Review: Marware USB Travel Dock for iPod Shuffle. Exploring the Print PDF dropdown options. Latest Stuffit Expander may crash Finder on Intel. ‘Right’ delete on the Mac. New Quicktime update provides Apple TV HD clues? Providing “proof” can get you better AppleCare results. Adding international characters to your text. Coverflow is “fuzzy” and not like the warm and kind. New music, Weila Walia by The Young Dubliners [iTunes]. Episode 003 of the new Maccast Loop. “The Loop”, offers a whole new way to join the Maccast community. It is recorded live each Sunday at 10:00 AM PST/1:00 PM EST. Using the Talkshoe network we offer live audience participation using text and audio chat. You can subscribe in iTunes or by using the links above and then join us live next week. In this episode we discuss gaming on the Mac. We wax nostalgic about all the great titles form the early days of the Mac. Great games like Dark Castle, Maelstorm, and Marathon Infinity. I give you a little history of Halo for the XBox and how it actually began life as a Mac only game. We talk a little bit about what’s happening with the latest games on OS X and ask how Intel may or may not change the future of Mac gaming. There is some discussion of iPod games and questions about what Apple might have planned for gaming on the new Apple TV. Of course at the end of the episode we take time for some questions and talk a bit about the rumors of 8-core Mac Pros. Ok, before you say, “A game on my Mac, you can’t be serious!” Well my friend I am serious. Yeah working with your digital music, pictures, and videos is great but under the hood of that Mac is gaming power that has been unleashed for your pleasure. I am a big supporter of gaming on the Mac. Ever since switching from my PC to the Mac I have found that games just look better on the Mac. The computing power whether it’s a Power PC or Intel based Mac, you will find Mac bliss. If you are asking yourself, “Will it run on my Mac?”. You will be pleased to know that it runs very smooth on my iMac G5. If you are not sure, Aspyr has a game agent which will tell you if the game will play on your Mac. 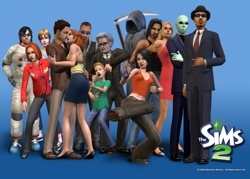 You can pick it up for free at www.aspyr.com.